"Trunk Records continue their quest to unearth the finest nuggets from esteemed composer Basil Kirchin with this latest epic find. 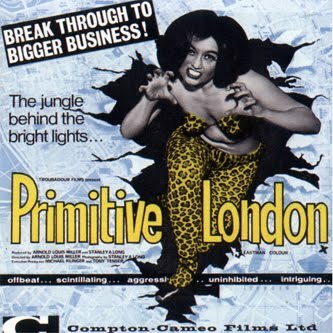 'Primitive London' is the first score Kirchin composed, and accompanied a somewhat exploitative documentary focused on the seamy underbelly of London in the 1960s - soundtracking interviews with strippers, swingers and whomever else the filmmakers could find to shock the conservative Great British public. Clocking in at just under forty minutes, the score has all the hallmarks of a great Kirchin release; pummeling percussive breaks, cascades of horns and that shocking attention to production detail, which allowed him to truly sound like nobody else at the time. The musical focus is, like much of Kirchin's earlier score work, focused on elements of jazz, taking the jazz band ensemble and placing it in the framework of score music. Here, unlike some of his later material, the sound is gloriously raw, and while it might lack some of the more jagged avant garde-isms of 'World Within Worlds' the music is effortlessly weird and curiously involving. It's easy to imagine the subject matter without having seen the original film (I haven't), and try and get a grip on how Kirchin was trying to get across throughs of a grimy, unseen London - the kind of London that the conservative right was so petrified of. This paranoia is explored with subtle expertise, and offset by those whimsical moments of calm that set Kirchin apart from his contemporaries. Trunk have done it again, and seem to be heart-set on doing us, the humble listeners, a service by digging up music that the rest of the world might have forgotten." What this review doesn't tell you is that this collection is comprised of the score from "Primitive London" and also "The Freelance" which is more jazz orientated. I will be posting "Worlds Within Worlds" later today. The first track is reminiscent of an instrumental pop song that did pretty well. Same lead/key. I'm having a mental block. Should be easy to recognize. Can you tell me what it is? damn, this is the roots of „broadcast“ sound!